David Arquette, the actor who played Dewey in the Scream movies, exists in the eyes of many as a living symbol of the death of WCW, the professional wrestling outfit that gave WWE a run for its money in the late ‘90s before folding in early 2001. The company’s death knell came much earlier, however: In April of 2000, Arquette won the WCW World Heavyweight Championship while promoting the forgettable comedy Ready To Rumble. It was a dumb choice that came to epitomize WCW’s many dumb choices, all of which tended to favor spectacle and publicity over character, story, and athleticism. Well, being loathed among the majority of wrestling fans wasn’t enough to turn Arquette off from sports entertainment. He’s been training in earnest of late, and returned for his most high profile match yet at GCW presents Joey Janela’s L.A. Confidential this past Friday. There, he wrestled not a normal, scripted wrestling bout, but a “death match” with GCW world champion Nick Gage, an ex-con and terrifying lunatic whose spilled blood in rings all over the world. Arquette was game for the majority of the bout, and even delivered some shocking moments of offense that had spurned fans cheering the actor. Unfortunately, the match took a scary turn when a shot in the head from a light tube saw Arquette’s neck cut open, causing the actor to visibly panic in the ring before leaving, returning, and appearing to take some genuine swings at Gage. Watch the footage of it below, but please note that it is very, very NSFW. There was ample confusion in its aftermath as to Arquette’s culpability in the injury, as well as what the actor’s state of mind was during the bout. Early Saturday morning, he tweeted, “Turns out Death Matches aren’t my thing.” On Monday, he clarified things, taking full responsibility for the injury and saying that he “did not know the extent of what I was participating in.” See his full statement below. 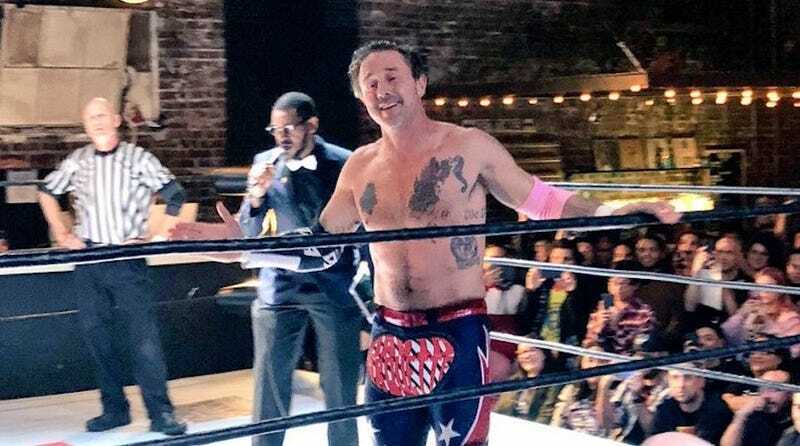 Despite the match’s messy ending, the online wrestling community seems to have absolved Arquette of his past sins, and one can imagine his indie bookings are about to go way, way up. Maybe a role in GLOW’s upcoming third season is also in the cards?